Recently my soul was fully cracked open in a beautiful laser coaching session with Regan Hillyer, Juan Pablo Barahona and Tamara X Hume under the marquee on the tennis courts at #Freedomfest2019 at the Royal Pines Resort, here on the Gold Coast. That’s where true wisdom lies. Several years ago I had a vision where I was on a stage speaking, sharing my story of LOVING YOURSELF INTO ABUNDANCE, on the screen behind were images of my heart whisper art. Regan’s timeline exercise took me right there. Then on the Saturday Juanpa along with the beautiful Kate Maree O’Brien, extended and expanded what had been awoken earlier and this vision kept returning. I hadn’t thought about this vision for many, many months. I certainly hadn’t been doing much to MOVE ME CLOSER to it. I had stepped off the path of my heart. I had allowed myself to be taken away from this work and my art, to pursue a way of doing business that DIDN’T ALIGN WITH ME OR MY VALUES. Whisper empire and give me the time for my art and to get a book or two written. BUT IT JUST WASN’T HAPPENING. I am back being me, MY AUTHENTIC SELF, ALIGNED TO MY VALUES. As one of my team said this week when I shared this on a live, HALLELUJAH! The laser coaching session was to help us cut through any block around abundance, money, or business, and support us to BREAK FREE of anything that was holding us back. They were going to take 10 questions and I was number 8. There were great questions with powerful laser coaching. When it came to my turn, I was thinking that maybe my question had been answered, then I got the nudge from my heart, “You must stand up!”. Yes, my question was about money, also 8 is a powerful lucky money number for the Chinese and I am an 8 on the Enneagram. So, up I stood. As we drove to the event that morning I had said to Des there is another layer under what I had peeled away so far. And now here it came, LIKE A RUNAWAY TRAIN. I shared my breakthrough and burst into tears in front of 300+ people. JuanPa asked me what was the real issue. I said it was about blocking my financial abundance. I believe I also had numbed out and stopped fully feeling my emotions. I had been told a year ago when told I was to start selling my art! As I was blocking my income flow. This was from another intuitive reader also an artist. I thought about it but never put it into action. I want to thank Regan for her 5 tips and JuanPa for his journaling questions, to help me dig even deeper and break through my money blocks. Then I received the perfect gift in the form of an abundance challenge with Regan and Juanpa that I have just completed. This whole experience has given me back my CONFIDENCE, the power of having boundaries, and total clarity on MY “WHY”. Now I am now ready to embrace it all with love and massive action. 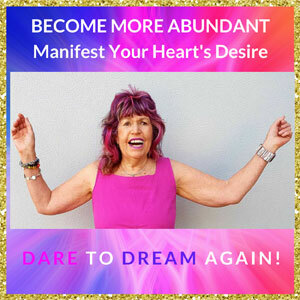 I know now that I have a business that is giving me THE FREEDOM TO BE TRUE TO ME, tell my story and is helping other heart-centered creatives and leaders love themselves into abundance and impact their lives, their families, communities, and the world. Plus a family of heart-centered entrepreneurs all ready to support one another. I feel truly blessed and know I have found my home and a way to move forward fearlessly. Maybe you are like me? You want true financial and time freedom, and to create ripples of love that impact their lives, their families and even the world? I am open to receiving the message that deepens my connection with the God within as we start the new week. BE OPEN to the whispers that come to you from your heart. Listen to and call on your angels, (your higher self, the God within) they have a message for you. Yes that perfection streak that has you doubting your CONFIDENCE. When you do let go you will move into being in FLOW. That’s when you will expand and your desires will begin to manifest. The wanting to know HOW stops you being in the flow with ease and grace. Today take time to meditate, visioning your desires – yes create the abundance list, read it daily and add to it. Journal on how that makes you feel. Really listen and follow the whispers and the nudges you receive. I know for me, I got a nudge to take time out at the weekend. I went for a long walk, rested and read a novel, cooked a yummy baked cauliflower with spinach and kale. Sometimes you have to step away from social media, Facebook, the computer, and more, to recharge your batteries. I’m writing this sitting on the beach. I’ve been journaling, meditating and sitting in stillness in my happy healing place. After a late brunch I will spend some creative time in my studio, then a beach walk with Des. Then time to plan the week ahead so I don’t just let it happen. Yes making a plan for the week is so important so life doesn’t just happen to me. Make sure you put in time for your morning rituals, inner work that we need to do to move forward with our business, our health, our money, our relationships and more. Yes take time to prioritise you. When I do, this stops my friend procrastination dropping in. Yes I have had to make some mindshifts here. Some serious consciousness shifting has been happening , especially around wealth and prosperity. This morning I woke up excited for the day and the week ahead. Life is changing quickly now and I am loving it. In my current online business 90% of the work I currently do is the inner work, yes on me, yes my growth and only 10% is a strategy. This is the total reverse to what I have been told I must do or have done in the past. I know at first I thought I won’t have to do the inner work. This will be a breeze. After all I have been a personal development expert for years. Mind you, I have always been great at helping others change more quickly that I maybe did. Des often says well you taught me that, especially around my language. Now I am loving what I am learning and being part of a supportive heart centred community tops it off. I had what you might call a bad start to the day, I got up early 4.30am to journal before I listened to a 5.00am workshop that I was looking forward to. The link wouldn’t work when I went to zoom, then I thrashed around trying to find out where the link was, re-signup, all of those things you do. Suddenly it dawned on me to check the date. As my friends on the other side of the world say – I live in the future, so instead being a day ahead I was a day late! Then I was online, not my current practice before I have done my morning rituals, now days not before I do my beach story and live. Anyway, the browser was open, so I checked out the website of Carrie Green who was running the workshop that my friend Harmoni had recommended. I do have her book, She Means Business, on order. That took me down another path, wow back on the bright shiny object trail – ego smiling and thinking “You can’t stay on one path, can you?” The path to freedom! So an hour or so later I was feeling disappointed with myself. I had done my morning prayer, welcome in the day, ritual. The journaling, meditation, exercises not done. I then realised that I need to realign myself or I would spend the whole day being confused and inefficient. Then it was time for the beach, my place of clarification and inspiration. Where I raise my vibes. Not to mention my resident beach coach, Des Walsh. As we talked I started having light bulb moments! As Des said it was a light bulb beach day. The light bulbs were about the risk of looking at yet another system, more books to read, more webinars to do, not going within and not taking action. My heart whispers totally out of the loop. But then, sometimes we have to venture out to go within. What I have got clarity on is that this weekend I am focused on decluttering and getting set to have new weeks when I give priority to my inner wisdom and daily action, that is focussed on my laptop lifestyle business and my art. The thing that does mystify me about this morning is that yesterday I had several lightbulb moments that shifted my consciousness, my mind: they were empowering. I felt it through my body. I felt energised and my vibes were raised. The real inner awareness I had as I drew a line in the sand. So I had to ask myself why late yesterday I thought that signing up for a webinar was going to solve some of my current challenges. I am now asking myself how much more information do I need to take in, to take daily action to move forward on my journey to freedom. This is also a pattern I recognise that I repeat. I am on a path to mastering something new, in my current case, my abundance mindset and neurosculpting. Then here I am, again, jumping onto something new before completing what I am currently reading and working with. Why do we forget that the answers are within? It is easier to look outside until we truly embrace the love that we are. “I love you, I really love you”, and feel it. To manifest our dreams we have to love ourselves unconditionally and trust our inner knowing. Then we allow the abundance to flow. Out of confusion came clarity. I will now use my clarity through contrast process to map out my next weeks to ensure that I am moving forward on that journey to freedom. Do you have some lightbulb moments that have given you a real wake up call? Caused you to stop and go within? Do You Talk To Your Guides Each Day? What Do My Guides Want Me To Know Today? That said to me it is time to do some deep delving on the journaling front. I had had one of those stop start weeks that has Me “all over the place.” Scattered I shared with a friend yesterday. One day I was high vibing, the next low on energy and sleeping more that I normally do. I then went to pick up the 3 cards that had fallen on the floor, think I wonder what this message is for me to expand on Your Heart Knows. Really listen to and follow the path and passion of you heart. Feel the love within you, allow it to say, “I love you”, and give yourself an inner Namaste. That I still have some work on self love to do. I know it is an ongoing process. REST card was on the floor too. When you rest you allow deep healing to take place, within your body, your heart and your soul. So 4 cards had flown out of the deck. Looks like my angels and guides had heard my prayers this morning and were delivering. This was a very significant reading with the rest card relating to the reversed love card. Are You Following The Path of Your Heart? What Will You Manifest That Will Empower You To Be True To You? Follow the path of your heart so your PASSION truly shines through. This allows your STRENGTH to empower you, to be really true to you. No more hiding. Yes come out from the shadows and dance. When we open our hearts to love we can step into the flow of life with peace and grace that comes when we are following path of our heart. Looking forward to reading what you are manifesting in your life. At a crossroad? If so reach out and email me or leave a comment below. HOW DOES MY SOUL OPEN INTO FLOW? Today I am sitting at Snapper Rocks in the healing sun. Currently I have been really slowed down by a dose of sciatica and a sore throat, not something I am enjoying. Below are the words that flowed as I shuffled my cards while gazing into the magic blues of the sea.. When you are bold you are stepping up into being true to you. With HOPE you open yourself to the magic of you! So today step onto the path of your heart with boldness! How will you step into your flow today? I spent New Years Day with a beautiful friend Yantra and her husband Richard from Living Alignment with other seekers of truth. It was a beautiful day and a heart opening way to bring in a new year. We shared food, conversation, meditation, music and more. Each year Yantra holds a special Satsang in her home . She has been doing this for 15 years. Des and I were at the gathering 2 years ago. So when Yantra asked would we be here again this year I said yes. Wonderful place for us to stay on our drive back home too. After the meditation we all spent time journaling. This was what flowed onto the pages of my journal. Grace wants you to fully love you and really share your message of love with the world. this week this will come to as you accept the message of The Power of Love. You now release all fear. You are here to color and heal through LOVE. Know that once you truly listen to and follow the path of your heart you will be fully aligned and the abundance will flow. Take consist daily action and know that you are guided from within. You must remember to believe you can, ASK and you will succeed. During the meditation I felt a shift. A warmness ( heat) came over me like a guardian angel saying you must be true to you. Create the environment that you truly desire. You have a message, so it is time to shine through Suzie. Your message is your truth. Your message will heal through your art, your blog, your books, your cards and more. It is time to open the doors to abundance. Yantra’s guru and teacher is Papaji and a photo she had of him was opposite where I was sitting. I felt his eyes staring at me, urging me to speak. I normally speak up and share my experiences during Satsung. Today I thought I don’t need to share today. 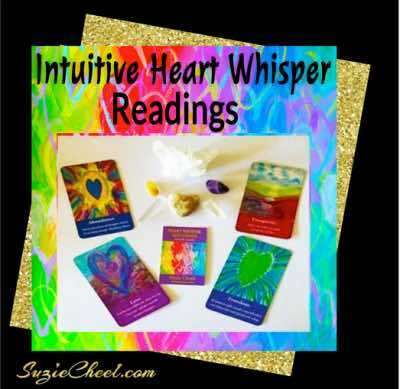 I was called from within to share a reading from my Heart Whisper cards. While away on holiday I started using the cards in a new way, to tell a story. I shared the first one here and I just used 6 cards. What does 2018 hold for me? We all then focused on our heartspace and as I shuffled the Heart Whisper oracle cards. Take time to be still, quiet your mind, let your heart whispers guide you, allowing you to just be. I then did a channeled reading that went something like this – would have loved to have recorded the reading. Trust was my word for 2017 so it’s interesting that it showed up again today. What we now need to do is to be open to receive and that then allows us to be in FLOW and sometimes we need to be patient. PATIENCE is something that allows us to be truly kind to our self. When we are being kind to ourselves we allow ourselves to BE OPEN to all the magic that is going to come for us in 2018. How will you be true to you in 2018? Ready to flow into 2018, treat yourself to your own special Heart Whisper Oracle card reading and get you own special just for you meditation. PARTY TIME: ARE YOU READY TO SHINE YOUR LIGHT? HOW WILL I SHINE MY LIGHT TODAY? Am I shining my true light the true me? How would I show up today? How will I shine my true like today? Then I did my prayers, ho’oponopono, meditation and visualised how I saw l my day flowing today. Hell Yes: if I am in full acceptance of myself, fully loving myself, releasing any judgements I might have about myself. I will do a reading for the final week of December and a focus card reading for 2018 for people who are online live with me and ask. 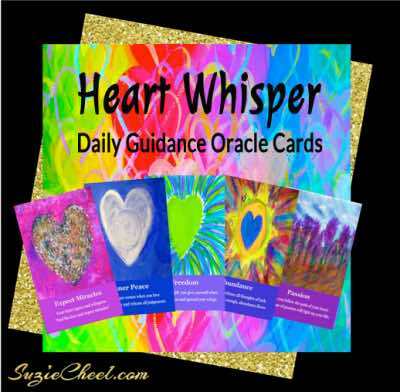 The winner will receive a reading with my heart whisper oracle cards that will empower you and help you work out what your focus is for 2018. This is the reading for this week. If you’re online and you’re there live I will draw your focus card for the week so my question now to you is how are you going to shine your true light today? How are you going to fully show up? It’s all part of becoming true to you and totally and fully loving yourself because it’s not until we fully love ourselves that we show up and shine! IS IT A HELL YES OR A HELL NO? ARE YOU SAYING YES TO YOU? What’s stopping you shining your true light? Usually it is fear and so often that’s so often unfounded. Your conscious mind is keeping you safe. You might even hear a whisper: this is just you shying away from allowing what is within you to come out to play and be shared with the world. Your heart knows to be truly true it’s time to say yes to you! Ask yourself today before you do something is it a hell yes? Okay how can we do that for things we know we don’t love to do? This is one for me today. I rarely do a load of washing, unless Des is away or as is the case today not well. I am about to do load number 3 for the week plus there were 2 lots of handwashing !. This is not a hell yes, sometimes things just have to be done that is not a hell yes to me so how do I make that a hell yes? First of all I acknowledge how blessed I am to have the most beautiful man who normally does all these chores. Because he’s laid up and really not very well at all, I just keep seeing him well and healthy, holding the picture as I do for my own health and healing. BTW I sometimes totally forget to ask myself that question and find myself back in the land of sabotage and back down the rabbit hole. I need to also ask myself if this is true to my message, my message about love heals, we need to open our hearts and love so we can do to dream again.Now I’m off to do something that does give me joy. Is a Hell Yes. I’m about to pack up some paintings to send off to US which will colour, delight and heal other people as well as open their hearts to joy. These 3 are on their way to USA. Finally I will put some of my textiles out for you to see if they might be a fit for your home or office. So what are you going to say a hell yes to today? I would love to read your hell yes and how it makes you feel in the comments.